Yesterday I mentioned the Hornby A3 and it’s impending makeover. 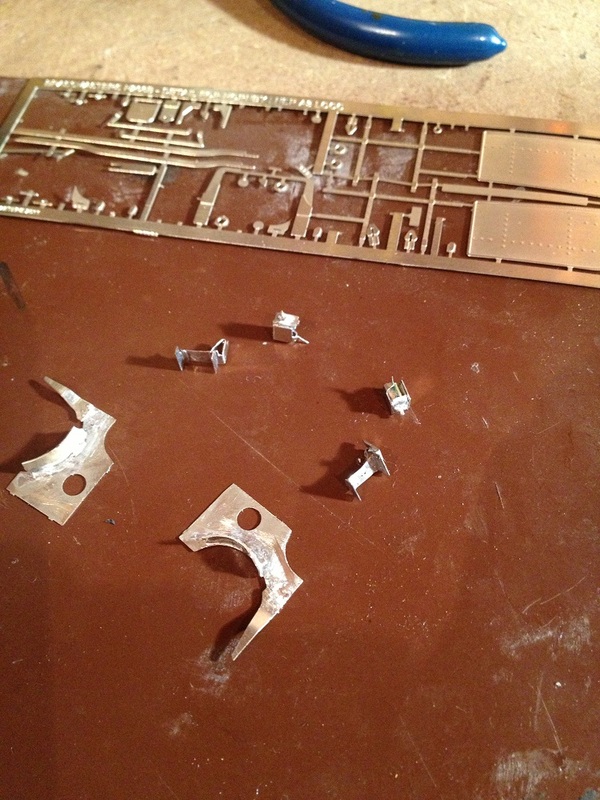 Here is the first day’s work then; the medium involved in this task being the Brassmasters detailing etch. 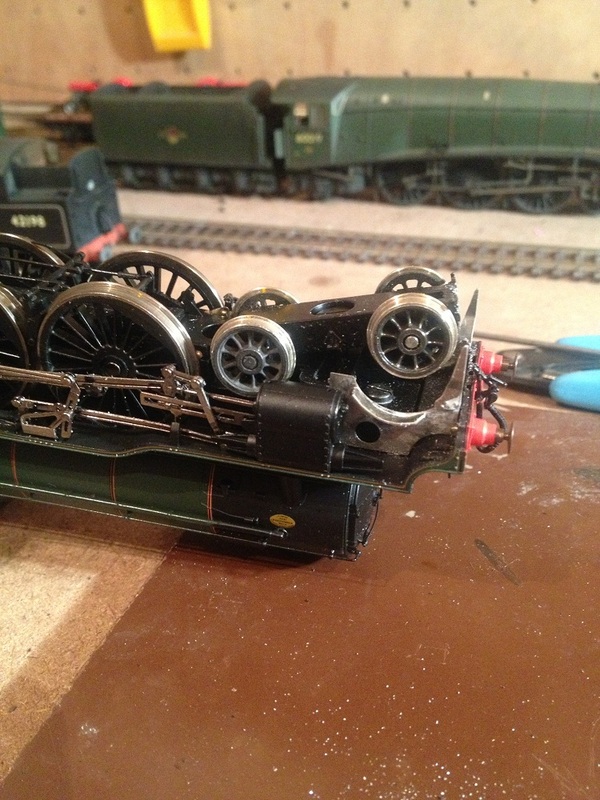 The relevant parts involved in this case are largely connected with the front end and concerned with improving the look of this end of the loco. A day’s work convinces me that these are fiddly assemblies but someone with more etched build experience than I have should probably do OK. I still have a developing skillset in this particular aspect of modelling. I’ve completed the building and fitting of the parts. The buffer ‘spring box’ is probably the trickiest part to build and install but this was probably more down to cack-handedness on my part! As with the bulk of etched soldering jobs, you really need three hands. The sub assemblies, specifically the front steps and spring boxes were offered up to each other and the dummy frames secured to the plastic frame representation on the model body. I ended up using epoxy for this since the original choice of superglue was less than super and resulted in the extensive deployment of industrial language befoore I settled for something with greater resilience! The jury is still out on whether the result will justify the effort but I’ll reserve judgement until the final finish is on the loco and all the aspects of the upgrade are fully merged into a homogenous entity! Incidentally, whilst I was waiting for the epoxy to cure, I turned to my ‘FX’ bench on the other side of the ‘Kennel’ to work on an A1 that was in for finishing to my current standard. It occurred to me that the side sheets at the front of the tender are a little on the butch side so I decided to experiment and dragged a scalpel blade along the inner edge of the side sheets. This gives the illusion of a thinner side sheet and as a visual trick it appears to work rather well. Once the tender is attached to the loco, the chamfer on the opposite face isn’t evident. Of course I’m going to have to go back and do my other locos the same way now! 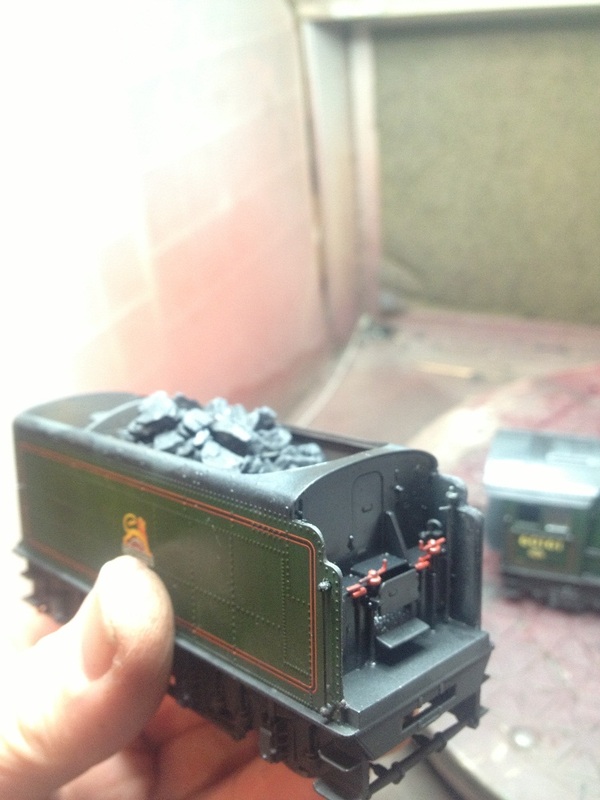 Pet hate of mine is acres of daylight above front bogie and wheels. From above it’ll make little difference but at lower angles it’ll be like – well, night and day. Chamfering works wonders, a great quick win. 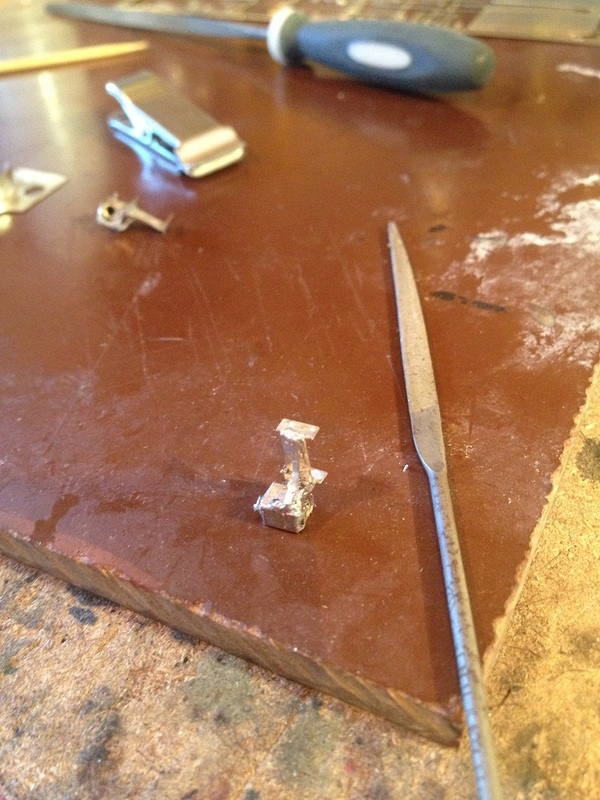 Until the scalpel snags as it did on one of my Stanier tenders and takes a bite out the moulding… ooops. Were those Markits wheels on the A3 bogie, did you say? How do you rate them vs Gibson? I personally like the Markits wheels, Jamie. These are of the later generation that have a more rounded web on the spoke. They’ve got all the physical presence you need. That’s not to say the Gibsons are bad either though I do prefer the superior user friendliness of Markits drivers. There’s a wee bit aft of the cylinders that could perhaps use an insert to hide some daylight. I may look into that before I go further. An excellent kit for a very good model, thank you for sharing.